Item: The Consumers Union is leading the charge to get state legislatures to adopt mandatory reporting requirements – see its StopHospitalInfections.org website, pitching the issue as consumer protection through disclosure of information “so consumers can make smarter health care choices, and hospitals have a stronger incentive to improve patient care." I have chosen to post BIDMC’s data [voluntarily] . . . . I continue to hope that my colleagues in the Boston area hospitals will join in and that our journalists and elected officials will provide the kind of positive reinforcement that makes this truly infectious behavior. Update 3/22/07: Across town, MGH had a bad day this week — an internal memo following up on a Joint Commission survey on lax handwashing practices, among other things, was made public. See the post on the Wall Street Journal’s Health Blog on this story, citing a Boston Globe editorial calling MGH out and giving kudos to Paul. So, what to make of it all? Paul Levy’s last point is important, because in this era of government-promoted personal responsibility for health care decisions, providers and government agencies are throwing a lot of data out there. It is vital that the general public be given confidence in the data, the tools to evaluate it, and the means to do something with the information provided. However, I have the constant niggling feeling that some folks out there – and, just to be clear, I’m not tarring Paul with this brush, as he clearly wants to trumpet the accomplishments of his institution and prod other hospitals to come clean, so to speak – some folks out there want to dump the data in patients’ laps and then say: see, we gave you data and now you can decide which hospital to go to, and no sniveling if you pick up a superbug while you’re there. 1. What is the message? Get past the presentation to the facts. 2. Is the source reliable? Think about the quality of the information. Information comes from many sources, good and bad. 3. How strong is the evidence overall? Understand how this information fits in with other evidence. 4. Does this information matter? Determine whether the information changes your thinking and leads you to respond. 5. What do the numbers mean? Remember that understanding the importance of a risk requires that you understand the numbers. 6. How does this risk compare to others? Put the risk into context. 7. What actions can be taken to reduce risk? Identify the actions you can take to improve your health. 8. What are the trade-offs? Make sure you can live with the trade-offs associated with different actions. 9. What else do I need to know? Focus on identifying the information that would help you make a better decision. 10. Where can I get more information? Find the information you need to make a better decision. Now, let’s apply one of these top ten questions to the issue at hand. Number Two: Is the source reliable? While some self-reported data may well be reliable, the question has to be asked: How is the data being collected? There may be biases tied to the method of data collection making the data source unreliable. Bottom line, as noted above: Transparency is good, but not just for its own sake. It’s worthwhile so long as information provided (1) is not distorted, (2) may be easily and accurately interpreted by consumers and (3) is actionable. Massachusetts moves closer to mandated reporting of HAI (healthcare-associated infection, or hospital-acquired infection); $64,000 question is: how does reporting help? 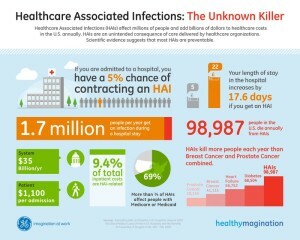 Healthcare Associated Infections: What is the Message, and What Can We Do About Them?